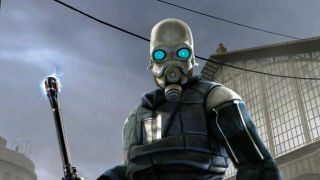 Valve is working hard on a new game engine, but the makers of the iconic Half Life series are still not ready to answer questions about a sequel to their most famous franchise. Gabe Newell, who heads up the company, started an interview with 4chan.org by asking for questions about anything other than Half Life 3, but he was prepared to talk about a new game engine. "We've been working on new engine stuff for a while," said Newell, continuing on the garbled recording with either "We've just been waiting for a game to roll it out with" or "we'll probably just roll it out with a game." Newell also insisted that it was an entirely new engine rather than just an enhanced version of Source. So why the excitement about a new gaming engine? Principally, because of Half Life 3 but also because the might of the Half Life franchise has already breathed new life into the PC as a gaming platform. Half Life 2 became one of the most important titles ever on PC, not least because it required users to have the Steam delivery engine to play it. This in turn meant that the gaming platform was given a boost of millions of installations, and the online store and multiplayer toolkit became the dominant player. A new gaming engine, therefore, not only hints at Half Life 3 but also could potentially give the PC gaming market a much needed boost. Of course, it would also put Valve in a nice place to take advantage of the new hardware in the widely mooted PS4 and Xbox 720 when they emerge, probably, next year.